Browsing down the aisles of the local Whole Foods market you might run into a packaged bag of dried goji berries. Some claim that the goji berry is the fountain of youth! This berry is colored bright orange and red and they come from a shrub bush that is native to China. Goji’s have long been known as a super berry in Asia where health food fanatics have been eating them for generations because they are said to help you live longer. Folk stories claim the berry can help heal everything from a fever, to high blood pressure to diseases like diabetes. While it can’t create miracles, there is some truth to these health claims of goji berries. They are, after all, very high in nutrients and goji juice can help you feel great and improve your athletic performance. 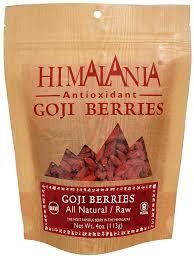 It is not clear whether the goji is superior to other berries, but they are healthy. The truth of the matter is, that all berries are very good for you and goji is just one more berry to add to your anti-oxidant arsenal. As with all foods, eat them in moderation because high doses such as what you might injest in a goji drink or vitamin supplements could irritate the stomach or interact poorly with certain drugs. It is always best to check with your doctor before hopping onto the bandwagon of the latest super food. Everything in moderation. Goji berries have a tangy taste and the whole dried berries have similar shape and chewy texture as raisons. They also appear in various juice and tea drinks. If you are on the hunt for goji berries check the local Whole Foods, health food stores, or the Chinese herb shop.